If you’re a fan of carrot cake I think you’ll be equally (if not more) in love with these ginger beet muffins. I’ve always been a fan of the warming spices and hearty ingredients that make carrot cake so damn good. Instead of going the traditional route here, I decided to switch things up with ingredients that we have at the farm (more beets than carrots these days). 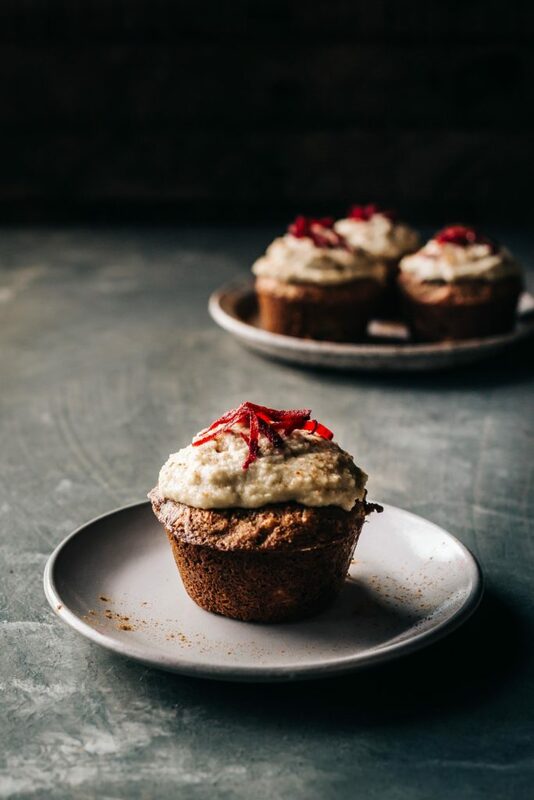 I decided to make these muffins gluten free with delicious almond flour (I love the flavor and texture the almond flour has here), plenty of shredded coconut and of course, all the traditional spices that make the old classic muffin so good. The beets add a wonderful sweet and earthy flavor that makes these muffins stand out. Not only are they beautiful, but everything comes together in a unique way to make for a delicious treat that is nourishing enough to fuel you up in the morning and tasty enough to treat yourself after dinner. If you’re skeptical about the beets, please don’t be. They don’t overpower and their subtle flavor is what makes these muffins so darn delicious. Trust me here folks! I hope you all give these muffins a whirl. Pour a cup of coffee, grab your spatula and get baking! Preheat the oven to 350F. Lightly grease a standard 12 cup muffin tin and set aside. In a large bowl combine the almond flour, salt, baking soda, cinnamon, ground ginger, cloves and shredded coconut. In a separate bowl whisk together the eggs, melted coconut oil, honey and grated ginger. Gently fold in the shredded beets and raisins. Pour the wet ingredients into the bowl with the dry ingredients and mix well. Divide the batter between the muffin tins and bake in the oven until lightly browned and a toothpick comes out clean when inserted in the center of a muffin. About 18 minutes. While the muffins bake prepare the frosting. Drain the soaked cashews and place them, along with the rest of the ingredients into a food processor and blend until smooth and creamy, stopping to scrape down the sides of the processor as needed. Taste for seasonings and adjust as needed. When the muffins have cooled to room temperature frost them. Top each muffin with additional shredded beets and sprinkle with cinnamon. Hello, this recipe sounds amazing! Do yu think I can use almond meal from ground almonds in my food processor or does it really have to be almond flour? Thank you! for this recipe I think you want to have a really fine almond flour. I don’t think you’ll be able to get the correct texture with almonds ground in your food processor. I haven’t tried it that way but I’m guess the texture will be off. I hope that’s helpful! I love your recipes but I had a question about this one. I think I would love it except for the shredded coconut. I hate the texture. Is there something I could use as a substitute? Or omit it and up the flour? The coconut has a nice subtle flavor here so it definitely doesn’t overpower and the texture isn’t prominent with the shredded beets, raisins and flour. With that being said, if you absolutely can’t stand it I’d try just leaving it out. Maybe add up to 1/4 cup of extra almond flour but no more than that as it may affect the effect of the leavening agent.I haven’t tried this recipe with altering measurements so let me know what you do!! Maybe this is obvious but should the beets be raw or cooked? Sounds amazing and I can’t wait to try it! I made these this weekend, they were great!! I adapted them a bit, i just kept the flour, traditional wheat flour. I think I would double the ginger both dry and wet next time. I like a lot of ginger. This recipe was amazing! We made it without the frosting to make transport easier (they’re for our work lunches). Even without the frosting, they are sublime. I’m so happy to hear!! I’ve only been a follower about a year but I’ve made these four times already. I think the recipe is perfect as it is. Making it in a few weeks for the bride and her six sisters for some healthy snacking as they get ready for her special day.